I don't really like winter. It's cold and snowy and did I already say cold? But keeping a few winter activities for kids up my sleeve gets us outside even during the months I'd rather stay inside! I love having a white Christmas but after that, I'm ready for it to just go! But, I actually have a family who likes winter (weirdos, I tell ya!). If you have kids that willingly go outside in winter here are some fun activities for them. And what about those kids who are like me and don't really care for the cold winter? Well, they should get outside once in awhile. It's probably not a great idea to stay inside from December until March. It's always good to have a few ideas up your sleeve to keep them outside for a bit, and maybe actually enjoy it! 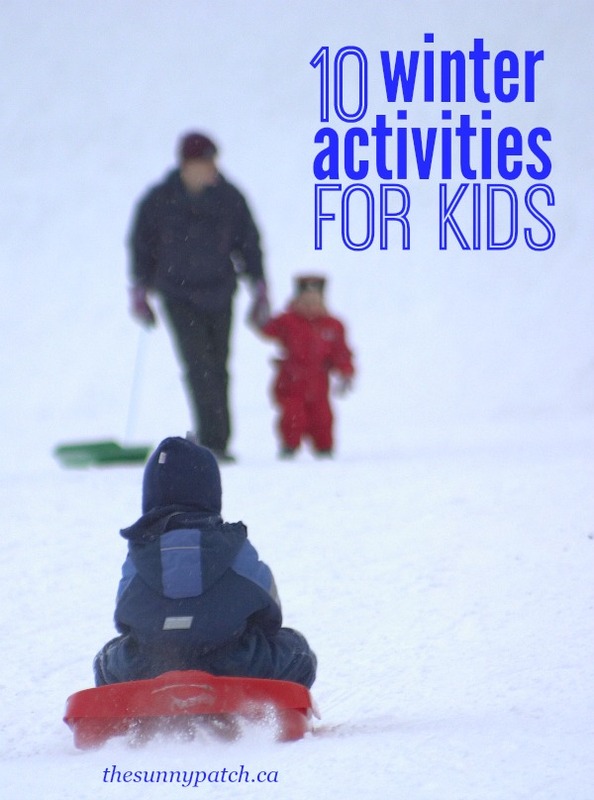 So here are ten winter activities for kids. For those kids who like the snow and for the kids that don't! Feed the birds – make some edible bird feeders to hang on the bare branches outside. Studying birds in the winter is a nice way to fit in some nature study when the rest of ‘nature’ is covered with snow. Make your own icicles – this idea for creating colorful icicles looks like so much fun! Might as well use that freezing weather for a neat science project. Freezing bubbles – that bubble solution doesn’t have to just be used in the summer time. You can use it to make frozen bubbles when it’s cold outside. Build an igloo – isn’t there a rule that you must build at least one snow fort every winter? A few of these (affiliate link -->) snow blocks would certainly come in handy with that! Make snow angels – I’m pretty sure there’s a winter rule about that one as well. Go make one today! Or do one of the other classic winter activities – ice skating, sledding, building a snowman or having a snowball fight. Create some snow art – mix some food coloring and water together in squeeze bottles then use them to draw in the snow. Make some ice cream – yes, you can make ice cream from fresh snow. That’s one way I do enjoy the winter! Build a snow volcano – take the earth science lesson outside with a snow volcano. Make maple candy – make some maple taffy with your kids – pour it right out onto the snow for a great winter treat. Take a winter nature walk – use the printable scavenger hunt below to explore the beauty of the winter season with your family. We can’t get rid of winter so we might as well embrace it and enjoy the family time together! These activities for kids are a great way to do just that. Don’t forget to grab a copy of the winter scavenger hunt! What activities keep your kids occupied in the winter? I can’t have the only family that starts to feel cooped up when winter is feeling especially long. Sometimes the best thing to do is just to get outside (all bundled up, of course!) – the fresh cold air can be invigorating. And it’s a good idea to have a plan or you’ll have kids banging on the door to come back inside after just a few minutes. So keep a few tricks up your sleeve and your kids (and maybe you) can spend a memorable afternoon together. Have some more fun winter activity ideas? Leave me a comment and tell me about your kid’s winter activities.